Well, not entirely monstrous, but green is not a colour that I can pull off with much success. Mr. L, who never comments on my makeup (other than to tell me I look lovely when I drop enough hints that he ought to be saying something), readily agrees that green is not a colour I should allow into my makeup-playing repertoire too often. About halfway through the day I asked him, “Have you noticed that I’m wearing green on my eyes today?”. And that ladies, clearly means that it looks amazing. Or not. I’ll go with the former. Do you ever get the feeling that you’re getting a bit old to wear bright colours on your eyes? I do. I mean, when I was 27…. I thought I was getting too old, but now that I’m 30 and I’m looking at the photo thinking, “I think it doesn’t look too weird” but, I surround myself (online) with beautiful women who love to have fun and enjoy a passion for makeup. What must women who don’t share our creativity when it comes to slap think? Of course, one totally shouldn’t care what other women think and I’m neither fishing nor asking for validation here, it’s just that being on the cusp of the wrong side of 30 makes me hesitate. Nothing more and nothing less, I guess it comes down to the fact that you can’t really pull off the “cute” thing once you reach your thirties, and so there’s no room for error in the same way as when you were younger. “Should know better”. I’d like that on my headstone… along with “One Day”, a long-held shot at faith. I usually only have time in the morning for the basics when it comes to makeup but Mr. L has been super-generous with his time in the run-up to releasing his next game, so you can expect a few more FOTDs than normal simply because it feels lovely to walk out of the house in a proper made-up face once a week you know? The type where you’ve played and pontificated over choosing what to apply rather than reached for the quickest, most fool-proof things you own. Anyway, I’m really rambling. I’ll do a quick product breakdown. What’s your colour nemesis? Do you hesitate when it comes to colour? My nemesis is your fave shade range, taupes!!! They just don’t suit me, they all seem too warm for me! I’m 32 this year (although I do occasionally get ID’d when buying alcohol) and I still like wearing bright colours on my eyes. You should wear what you like, the only thing holding you back is worrying about what other people think. My colour nemesis for eyes is anything that’s red-toned but sometimes black eyeliner helps with that. Age, or age restrictions, are all in the mind! 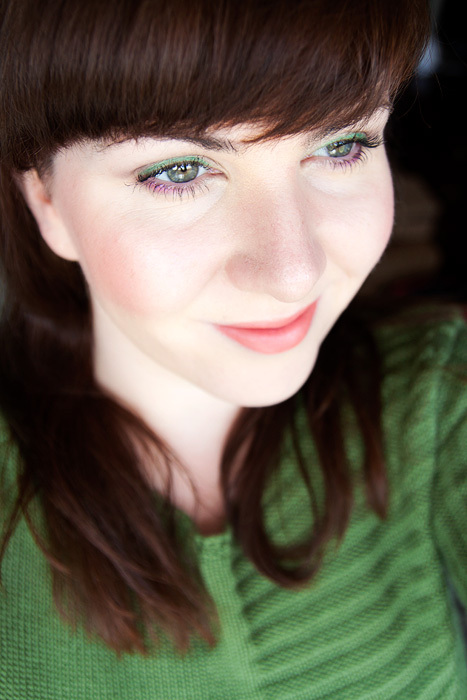 I like you cannot get away with green (although you have done a smashing job in the FOTD above) I also can’t wear pinks for some reason. And have to be pretty careful with blues as to not make my eyes look incredibly dull. I’d like to be able to do a smokey eye with a little more finesse but hooded eyelids always make me really wary of overdoing it. Basically, if you can see the smoky bits when my eyes are open… I’ve applied the eyeshadow far higher than I’ve really got the balls for! I think it looks nice! However, I am a sucker for greens on people with red tones in their hair. I think wearing colourful make-up is more to dow ith confidence than age. If you’re 16, wearing neon blue and feeling like an idiot – you’ll look like an idiot. If you’re 50, wearing neon blue and feeling like a gorgeous diva, you’re gonna look like a gorgeous diva. Hi lovely, confidence definitely plays a big part in it, I think you’ve hit the nail on the head! People have made judgements about me all my life because I love to wear makeup. I’m an expert at applying it (ex-model so had good teachers) so it looks immaculate. My colleagues used to think I was ‘false’. S*d them, it didn’t stop me in my career. And red lips! I’m the queen. Be who you are, if you like makeup, wear it whatever the colour. Some people will like it, some people won’t. Keep on doing what makes you feel good. For me, makeup is part of my character, I’m not hiding myself behind it. Enjoy yourself, you look wonderful (and the others are jealous ‘cos they can’t do it!). Keep doing what you’re loving! You look gorgeous! Green and peach/coral are one my favorite combinations! Well, judging by this alone, I say you can pull off green. Speaking of being too old, I’ve been wondering that myself. But, if I went with what people do in my town, I’d never wear makeup ever. Not only do women not wear brightly colored makeup, they don’t seem to wear much at all. Lots of bare faces around here. Do you feel quite conspicuous with that situation? The women in my family don’t wear much makeup, there’s only one that shares my passion and she’s nowhere near as obsessed as me. I am old-45! I know what you mean-sometimes brights feel too young. But every once in awhile, I’ll pull out a bright shade and use it as a liner on the top or bottom, just like you did. I think it’s more of a discreet way to wear brights. And honestly, we shouldn’t really care and wear what we wear. Look at Iris Apfel-that woman is 90 yrs old and rocks brights every day! Purple isn’t the best for my face, apparently. When I wore the WnW Lust palette, my boyfriend said that it made my undereye circles stand out more. When my best friend wore purple makeup, her boyfriend flat out said that it looked like someone punched her in the face. Booo for tactless methods of shooting down our imagined beauty! I appreciate that he’s always honest with me, but sometimes I just want to feel pretty, but there’s better ways to say that the color just isn’t working without insulting the makeup. Purple isn’t the best for my face, apparently, which is sad because everyone says that green eyes work best with purple shadow! When I wore the WnW Lust palette, my boyfriend said that it made my undereye circles stand out more. When my best friend wore purple makeup, her boyfriend flat out said that it looked like someone punched her in the face. Booo for tactless methods of shooting down our imagined beauty! I appreciate that he’s always honest with me, but sometimes I just want to feel pretty, but there’s better ways to say that the color just isn’t working without insulting the makeup. My mum is 58 and she’s still rocking the bright eyes! She adores purple and so she often does a smokey purple eye or even an all-over-lid purple (the MUA iridescent purple one is her current fave!) She always looks put together and it never looks like she’s mutton dressed as lamb since she has the confidence to pull it off – that and she doesn’t over-apply it so she doesn’t look like she’s on Dynasty! Being young at heart is all that matters. That and you’re gorgeous anyways! I find it can be tricky to find the right greens to wear since I have mostly green-ish eyes, er hazel?…whatever. MAC Modern Pewter has become a staple “green” for me, even though it’s not *really* green. It seems to complement my eyes instead of compete with them, and it’s a bit cooler toned than most greens I own. Although, this could all be in my head. I use it dry with a fluffy brush so it doesn’t get too metallic for my taste.